Twitch Prime customers, those who have linked an Amazon Prime account to the game streaming platform Twitch, get free games and digital items regularly each month. The last month was filled with an impressive list of free games that Twitch Prime users could add to their account. Among the many games made available during the time were smash hits such as Tyranny, Serial Cleaner, The Bridge, Tacorna, or the SNK Bundle. Twitch continues the spree by providing customers with another set of free games and virtual items that that can add to their account. Note that games and items remain accessible even if you decide to cancel your Prime membership. A total of five games are listed currently on Twitch when you are signed in to an account that is eligible for the offer (read Amazon Prime account linked to the Twitch account). All you need to do to claim the offers is to click on "claim offer" under each of the listed games to add them to the account. 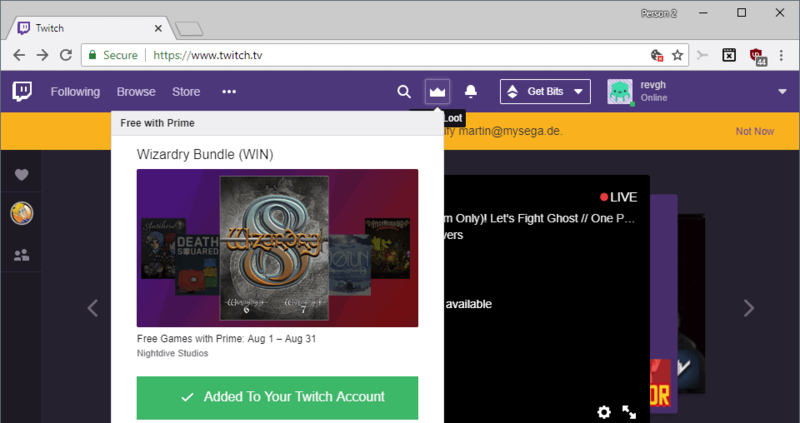 You need the Twitch Desktop App to play the games on your Windows PCs. All released games are only available for Windows. Wizardry Bundle includes Wizardry 6, 7 and 8. Wizardry is a classic RPG series that was very influential. The games are classic games that don't look too good on today's systems. Wizardry makes up for it with great gameplay if you like roleplaying games. Jotun: Valhalla edition is an action-style viking adventure game by Thunder Lotus Games. Antihero is a fast-paced multiplayer turn-based strategy game that plays in Victorian London. SteamWorld Dig is a platform minding adventure with strong Metroid and Terraria influences. Death Squared, finally, is an addictive puzzle game that you play in co-op. The game is all about cooperation to solve each level and move on to the next in line. Apart from the listed games, digital loot is also available. Digital items are available for RuneScape, Overwatch, PUBG, Warframe, and Call of Duty WWII. To claim one, some or all of the offers click on the crown icon on the Twitch website after you have signed in and linked your Amazon Prime account to Twitch. You find all offers listed on the page. Now You: What is your take on the free loot that Twitch hands out monthly?